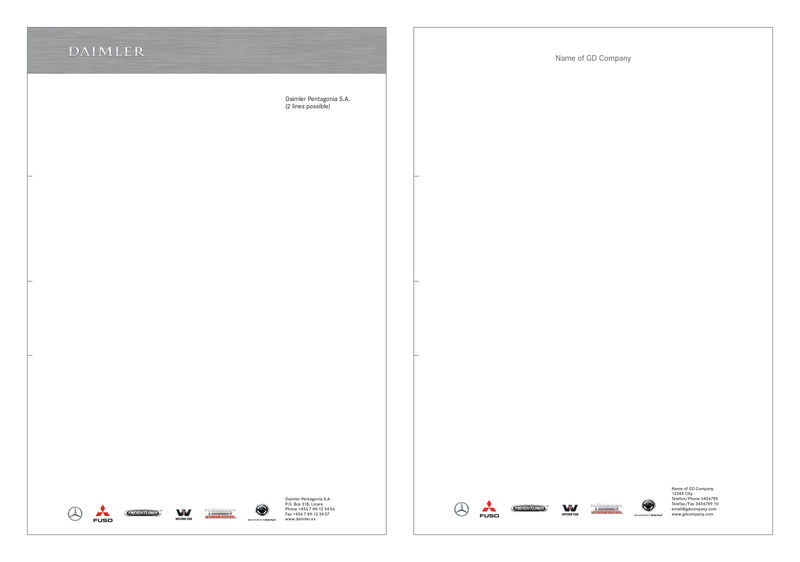 The Daimler multibrand stationery complements the visual appearance of the dealer. It should be aligned with the elements of the dealership. For Daimler-branded stationery the respective design manual must be observed. These all use the corporate logotype, which is produced in silver based on a hot-foil embossing process, and the silver brushing area. For all commercial vehicle dealerships with sales and/or service of multiple Daimler Group commercial vehicle brands the Daimler multibrand stationery will apply. Das Layout vermittelt dem Gestalter und dem Auftraggeber einen Eindruck über die Form der späteren ... of the letterheads shown here is in accordance with DIN standards (DIN A4) and takes into account the requirements of German corporate law and recommendations from the postal service. For Daimler-owned dealerships the name of the company is positioned on the top right corner below the silver brushed area. For General Distributors the name of the company is positioned on the top center of the letterhead. In the footer the different Daimler commercial vehicle brands are reflected by their brand marks from left to right (according to the sequence of the pylon) with the address of the company at the end on the right. 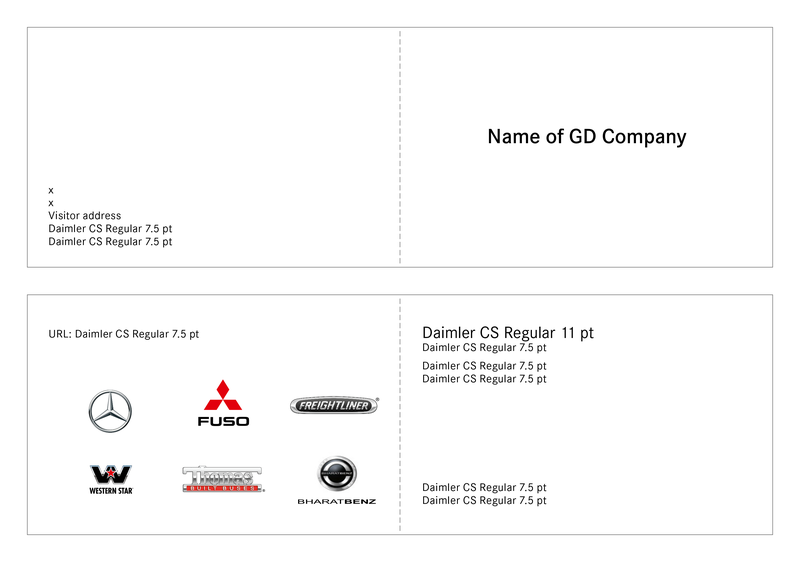 Supplementary to the letterheads the business cards shall further reflect the different Daimler commercial vehicle brands of the dealership. The business cards for more than one brand shall be fold-out business cards. On the outside front cover of the business card the name of either the Daimler-owned company or of the general distributor is in centered position. 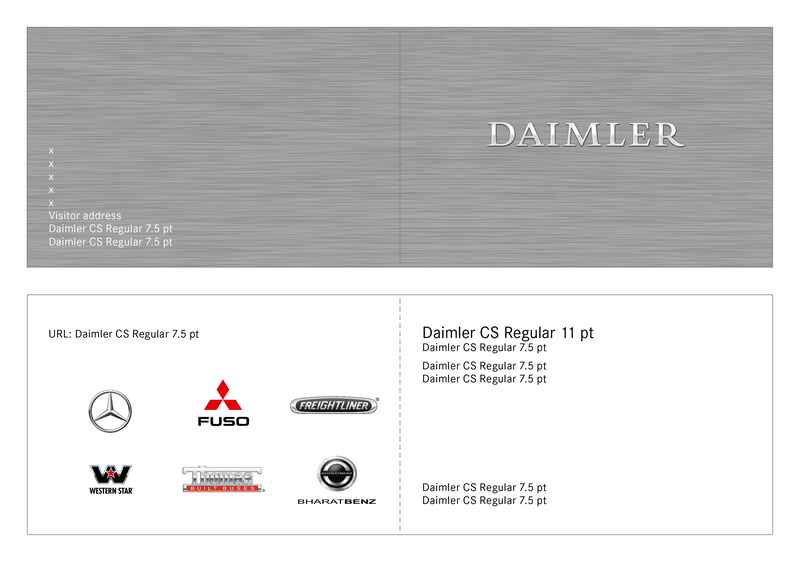 Only the business cards of Daimler-owned companies have a brushed surface and the corporate logotype on the outside front cover and a format-filling brushed surface on the outside back cover. The inside front cover of the business card reflects the commercial vehicle brand marks (sequence according to the stationery), while the inside back cover shows the name and position of the business card owner. The outside back cover of the business card can reflect further details of the company.